In the center of Piazza del Popolo is the Flaminian obelisk, supported by a fountain with four lionesses at the corners spouting water. It is 78.7 feet tall (119.75 feet with base), weighs 263 tons, and is covered in heiroglyphics. The pharoah Seti I (1318-1304 BC) decorated three sides of this obelisk, made of Aswan granite, and his son Ramses II carved the fourth, and erected the obelisk in the sun temble at Heliopolis, a capitol of ancient Egypt. Some believe that it was during the reign of Ramses II that the Exodus of the Hebrews from Egypt occurred. In inscriptions on one side of the monolith, Seti I describes himself as "the one who fills Heliopolis with obelisks that their rays may illuminate the Temple of Re." Ramses II, one of history's greatest self-aggrandizers, styled himself as one who made "monuments as innumerable as the stars of heaven. His works join the sky. When Re shines, he rejoices because of [the obelisks] in his temple of millions of years." 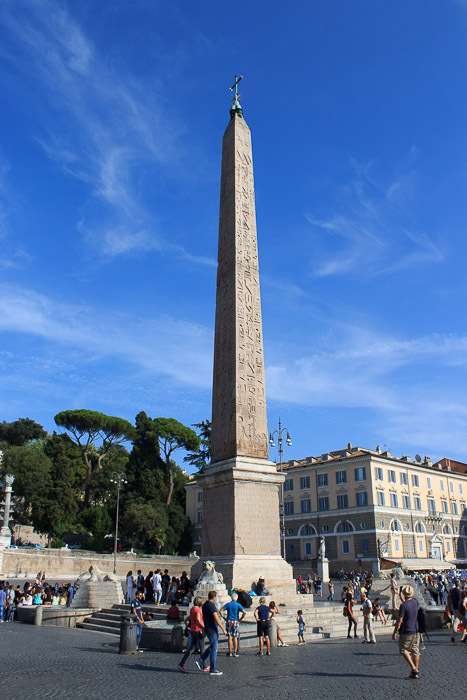 The obelisk was brought to Rome by Augustus after the death of Antony and Cleopatra, and erected on the eastern end of the spina of the Circus Maximus, being rededicated by Augustus in 10 BC to the Sun, making this the first obelisk erected in Rome. 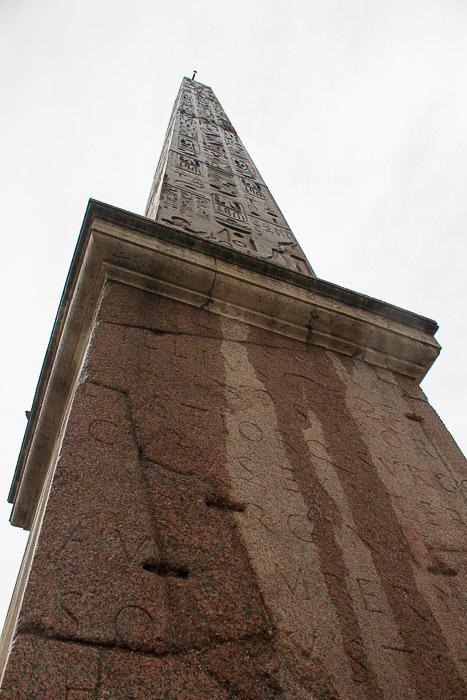 A vessel was specially constructed to transport this obelisk and the Solar Obelisk from Egypt to Rome, then another was constructed to carry the obelisk up the Tiber River. Augustus erected the obelisk on the spina of the Circus Maximus, where it was joined nearly 350 years later by the Lateran Obelisk. It fell during the wars between the Byzantines and the Goths for the control of Rome in the 6th century AD and it was covered by debris. In 1587, it was found in two pieces, buried in the Circus Maximus, along with the Lateran Obelisk. It was excavated and repaired (it was slightly shortened). In 1589, the obelisk was moved by Pope Sixtus V to its present site as the centerpiece of the Piazza del Popolo, where three major avenues of the city converge. It was topped by the mountains and the star of Sixtus V. Sculptures with lion fountains were added to the base in 1818. Since the Piazza del Popolo is located at the Flaminian Gate in the Aurelian Wall (the spot where Via Flaminia enters the ancient city of Rome), the obelisk is known as the Flaminian Obelisk. The Flaminian Obelisk can be seen from the Victor Emmanuel Monument, at the far end of Via del Corso. See all Flaminian Obelisk photos.